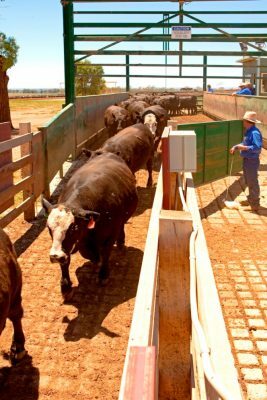 A SOFTER feeder cattle market since early January has contributed to an improved – albeit still loss-making – result in Beef Central’s latest 100-day grainfed trading budget calculated this morning. In our first monthly projection for the 2019 year, our standard set of variables (see list at base of page) has produced a negative $81 result on a typical 450kg flatback feeder steer, entering a Darling Downs feedlot today and closing-out after 105 days on feed in mid-May. That’s a considerable improvement from a $125 loss recorded in our previous budget calculated back on 18 December, but profitability continues to be plagued by near-record high feedgrain and roughage prices. The big inflow of cattle hitting the market over the past three weeks due to further intense drought pressure has pushed our heavy feeder price (flatback 450kg, ex Darling Downs) down 25c/kg since our late December report, to 285c/kg this week. There are certainly grid offers in the market above that rate, but equally saleyard cattle meeting our spec have sold cheaper than that in recent days -but 285c is reasonably indicative of where the market presently sits. The figure is the lowest recorded since September, when feeder prices dipped to 280c/kg briefly. High occupancy levels in all feedyards at present is further limiting demand for feeders. But going forward into 2019, there’s growing expectation that availability of heavy feeders this year will be quite limited, which may push prices higher. Today’s feeder price of 285c/kg values our 450kg feeder at $1282, a sharp $113 fall from December prices. While there was a little relief seen in grain prices during December after localised patchy rain across NSW and southern QLD growing areas, current representative ration prices in Darling Downs feedlots is $450/tonne – unchanged from our December report. While some downwards pressure exists on wheat, barley and sorghum prices, other ration inputs like cottonseed and almond hulls has actually firmed this week on earlier rates (see this week’s feedgrain report). Ration quotes from downs lotfeeders this week range from $450/t to $500/t, depending on each yard’s grain position, the quality and performance of the ration, and other factors. Current ration pricing is back on quotes of $470/t seen during November and a record-high of $500/t in our report back in August. Today’s quoted ration price means the total feeding cost per beast in our calculation is $705 a head, down $35 from rates back in early November. But today’s figure is still $55 more than our July 2018 budget figure, when total feeding cost was still only $650/head, based on rations worth $415/t before the worst of the grain price rises hit. Today’s total production cost (using the variables listed at the base of this page) is $2092, back $115 from a near record $2207 in December. Cost-of-gain remains the same at 336c/kg, 38c/kg less than the all-time record ration price recorded back in August. For better-performing animals gaining at 2.2kg/day instead of our standard 2kg ADG, cost of gain in today’s budget drops to 305c, and takes 20c/kg off the breakeven price. The above variables deliver a breakeven in today’s trading budget of 593c – a significant 33c/kg advantage over December’s figure of 626c – due to the relief offered by significantly cheaper feeder steer price. Breakeven on better-performing cattle gaining at 2.2kg/day this week would be 575c/kg. One of the considerations in feeder cattle performance this year has been compensatory gain, due to nutritional stress caused by drought. This was discussed in a separate Beef Central article published before Christmas (click here to view). Queensland processors competing for grainfed 100-day cattle are this week offering forward contract prices for slaughter mid-May around 570c/kg, due primarily to additional numbers available due to heavy feedlot occupancy. As we highlighted in our introduction, a 570c/kg forward slaughter price for May delivery and breakeven of 593c/kg suggests a loss of $81 a head on our 100-day grainfed program. While still a loss, it represents considerable improvement in trading outcome compared with November’s record $205 loss, reflecting just how tough conditions were for lotfeeders during the 2018 trading year – arguably the worst 12-month trading period since this report sequence started back in 2011. On better-performing cattle gaining at 2.2kg/day, the current projected trading budget loss eases to just 17/head – depending on cost structures and how individual feedlots perform. Cattle that went onto feed in mid-October, closing-out for slaughter this week, were contracted forward by southern Queensland processors at around 570c/kg. That compares with spot price in processor grids for 100-day cattle this week around 550c/kg, back 20c/kg or more on opening offers seen back in early January. It means processors who forward-bought today’s grainfed kill back in October are 20c/kg or about $70 a head worse off, compared with buying the same cattle on today’s spot market.